"Her lips were soft against mine; the touch was hesitant and breathtakingly her and so damn sweet. I inhaled her through the kiss, pulling her deep into me. My brain shut down as I reveled in her kiss, like a dog rolling onto his back for a belly rub. I rose without thinking, my hands falling to her hips. She grabbed my upper arms, her fingers digging into my sweater in a way that had my entire body throbbing." I really love this swoon, because it is from Kyler's point of view. I feel like most swoons are from the girls perspective, so I switched it up a bit this week. Everyone say hi to Kyler Quinn, my latest book boyfriend! I waited up just for this one Teresa!!! Perfection. Sighhhhhh. Yeah Kyler is already added to the book boyfriend list!! You waiting up makes me feel all warm and fuzzy inside. I cannot wait for you to read this one so we can discuss! Oh my god I love you so much for posting this! Ahhh can't wait for Kyler!! Omg thank you so much for posting this! 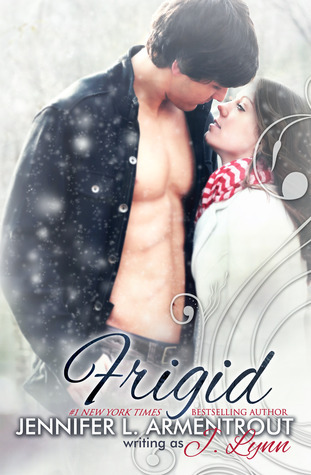 I've been dying for any teasers/swoons from Frigid, especially after reading the first three chapters. You're so damn lucky you got to read it :P And did I mention I love Kyler already? You are so right - many swoons are from the girls point of view. So glad you mixed it up. Great swoon. I'm liking Kyler. Oh yes!!! It's so good! But JLA rocks at swoons! I need this book so bad! Great great GREAT swoon! Awesome swoon! I am dying for Frigid to come out. I a in desperate need of a JLA book right now. Thank you for the giant tease!! Happy Reading!! Niiiiice swoon! Thanks for sharing, Teresa! Lucky Girl :D! I have a feeling that I am going to love Kyler. Can't wait to read this book. Loved the swoon you shared with us. Oh, Teresa...thank you for that! ;) I'm swooning and can't wait to read more Kyler! Me likey! Male POV swoons rock! And in the case of JLA, I loved the extra chapters in Obsidian from Daemon's POV, and I'm so psyched for the 4th Lux, which is dual! My Swoon from Elegy by Tara Hudson. Arrrrhhhhhh FRIGID...OMG I need this book NOW!!! I haven't even read it yet & I'm already swooning all over the place for Kyler. JLA knows how to write swoony guys. Ahhhh that is so awesome! I am so glad you loved the swoon so much!